Rodriguez and Renzi are a perfect match for the psychotropic imagery of “FBP”. 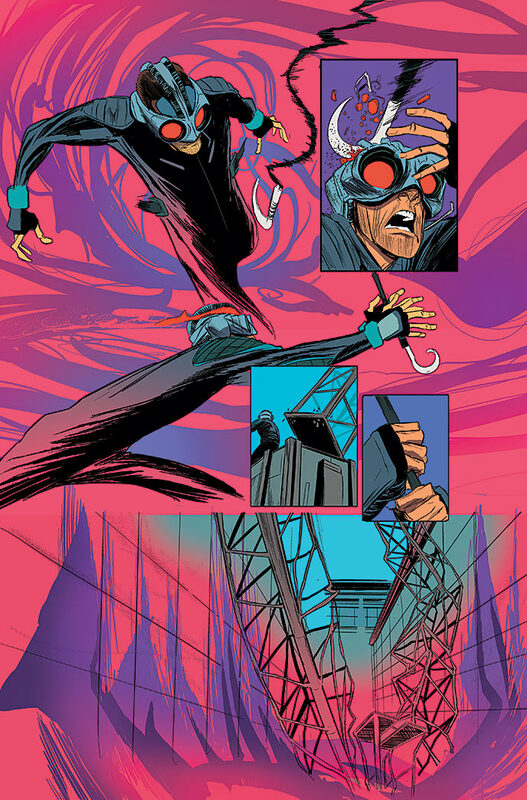 With memorable images by Robbi Rodriguez that are ready to burst off the pages, and the exuberant pop palette of Rico Renzi, the first volume of “FBP: Federal Bureau of Physics” boasts one of the most exciting art teams of the past year. Unfortunately, the stale characterization and dialogue can’t pull what ought to be a fun series out of the depths of mediocrity. 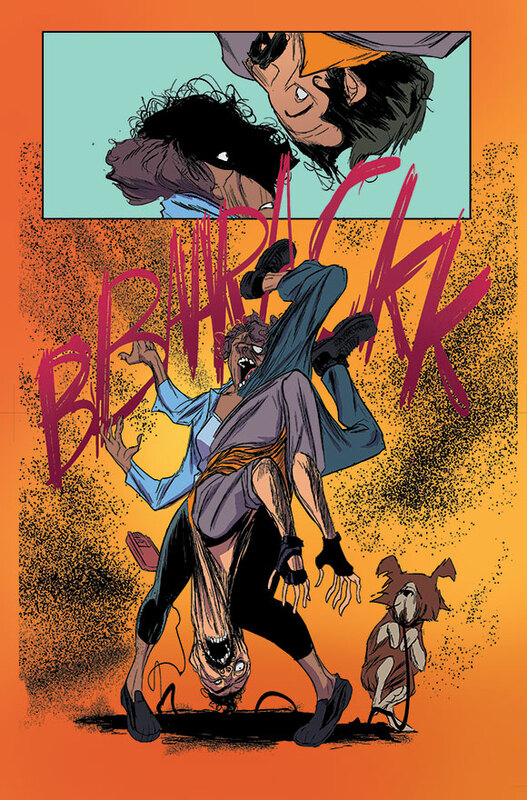 Writer Simon Oliver has some seriously original ideas gestating within the pages of “FBP: Federal Bureau of Physics, Vol. 1: The Paradigm Shift”, but they are bogged down by characters we struggle to care about and structuring that begs for another draft to smooth things out. “The Paradigm Shift” introduces readers to a world where the impossible becomes possible and the laws of gravity and physics aren’t as rigid as we know them to be. This is where the Federal Bureau of Physics comes in. This is a government agency tasked with investigating extraordinary occurrences like college students floating above their campus, phantom cities appearing in the skies above a heavily inhabited metropolitan, and worm holes that open doors to other realities. Again, Oliver develops a compelling reality in “FBP”, but he doesn’t spend the same energy on the rest of his book. Jay: Adam, look out, the Jefe’s on a warpath. Adam: Thanks for the warning. Cicero: I guess that would explain the lipstick on your cheek. Most of the dialogue in “FBP” is similarly wooden. I found myself paging through the book repeatedly to re-read Adam’s scenes and finally walked away not feeling much for the character. Rodriguez and Renzi are left to do the heavy lifting by enlivening the story with exciting images and terrific character designs. Rodriguez and Renzi are completely unrestrained in the stunning “Bubbleverse” scenes. Rodriguez brings a sketchy animated style that is almost reminiscent of Chuck Jones, but it is certainly distinct enough to call the artist’s work unique. His characters are attractive and filled with emotion; Rodriguez has a strong sense for body language and easily conveys rage, lust, disappointment, anger, confusion, or whatever is required from Oliver’s script. On top of Rodriguez’s fantastic images lies the uninhibited colors of Renzi, a colorist whose funky sensibility gives the book its limitless visual energy. One of the book’s best sequences is when Adam and Jay are sent to the “Bubbleverse” (the aforementioned phantom city) to bring back a wealthy entrepreneur who may be on the lam. Renzi uses muted colors at first to illustrate that the heroes are no longer in Kansas. For the most part, the inhabitants of the “Bubbleverse” are drawn with minimal lines, most of their characteristics are suggested by Renzi’s colors. Rosa: That naturally a Hispanic woman would only be employed in a cleaning capacity. Rosa: I suggest you call Special Agent Cicero. Rosa: Because his new field agent is here… Agent Rosa Reyes. I’m not sure why Oliver didn’t just throw an exclamation point at the end of that histrionic last line since it would have fit the tone of the scene. The writer doesn’t include Rosa’s opening sentence because there’s nothing reasonable that would have caused the dialogue that followed. She wouldn’t have said “I’m here about a job” or asked “Do you have any openings?” What exactly did the administrative assistant “misunderstand”? Scenes like this made me wonder why Oliver’s editor didn’t have the writer turn in a more polished script. I believe the verbal altercation between Rosa and the admin could have worked, but not as it was written here. In a scene later in “FBP”, a female criminal tells Rosa, “Behind the badge and vow, Agent Reyes, we’re more alike than you’d care to admit.” If you’re going to use the “we’re the same, you and me” line, it needs to be backed up with something substantive or it comes off as exactly what it is: a cliché. Despite all of this, “FBP: Federal Bureau of Physics” does have numerous positives. Of course there’s the memorable imagery from Rodriguez and Renzi, an artistic team who I am hopeful will work together for years to come. Oliver’s story, the world he’s created, and the backstory he’s come up with for Adam and Rosa, are all strong. Unfortunately, it’s the lack of attention to characterization that brings “FBP” down again and again.